← “A Starbuck Moment” … nesting instinct??? 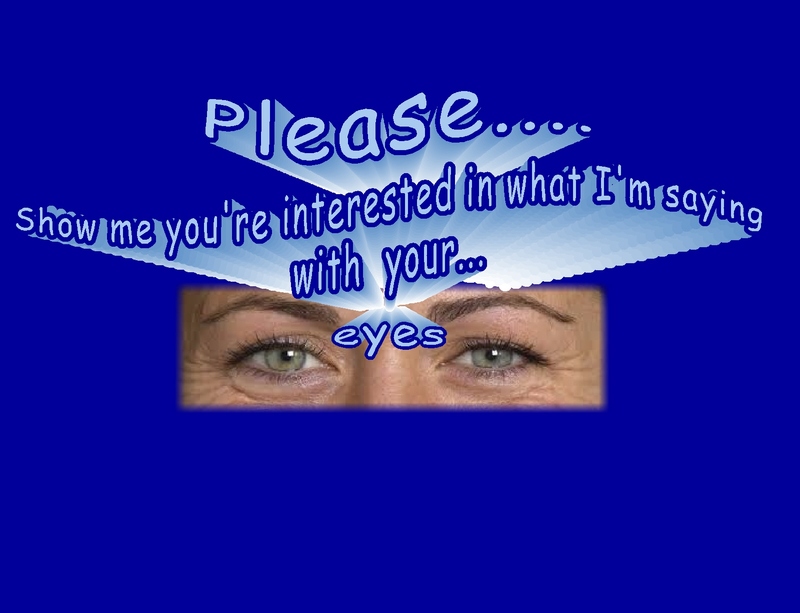 We all communicate with our eyes…. that communicate the full range of our human emotions…. we’re often talking about far more than simply asking for our words to be “listened to”…. about interest, connection and engagement being extended to each one of us. I went to a workshop in September that emphasized how frequently we don’t give our full attention to others as they are talking to us. The workshop was focused on children with social interaction challenges, and how they often don’t make sincere, interested eye contact…not simply looking at another person’s eyes, but showing interest and care with that eye contact. Several days later, it occurred to me that busy adults…myself included… often don’t remember, or take the time, to pause and really connect with others…to take that time to listen, to make sincere, caring eye contact…to give and receive that contact and interest. 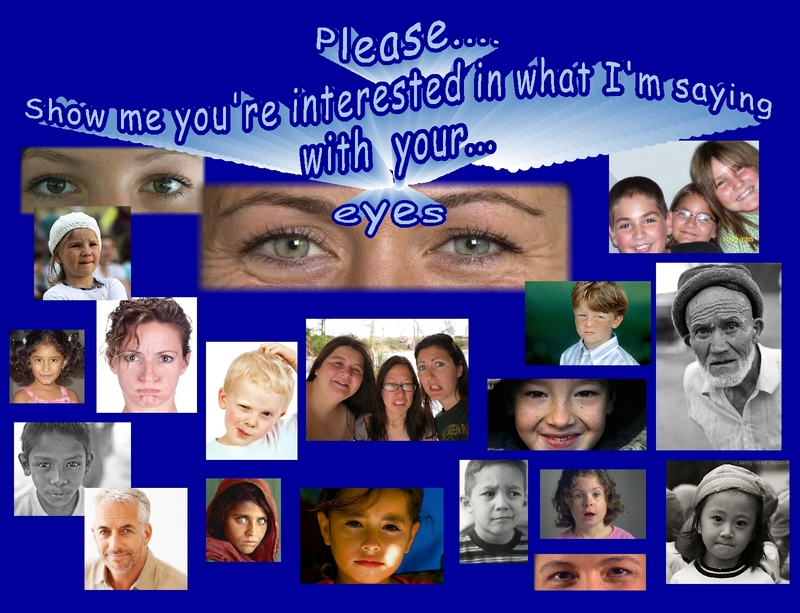 And how someone might say…”you’re not listening to me”…..
but not with the eyes…. Link to a wonderful post by Nancy Hatch on Spirit Lights the Way… “An Open Heart” She has a photo in that post that might warm anyone’s heart…and wonderful, insightful observations about happiness, kindness, compassion and the remarkable power of maintaining a twinkle in one’s eye and in one’s heart….. This entry was posted in Awareness and tagged Inspiration, Kindness, Life, Mindfulness, Spirituality. Bookmark the permalink. Good thoughts, Kathy. If we don’t make eye contact as we listen to others, we send the message that we are only paying partial attention ~ the rest of our attention is on the magazine we’re reading, the show we’re watching, etc. Beautifully written – when we listen with our whole self ………. yes i am pretty nerdy – i love research about The Mind ….. Very Heart felt poem . I’ve read research that we have “mirror neurons” in our brains… we watch another person’s facial expression and mirror it in our mind and then bring recognition of the other person’s emotion through that mirroring/recognition process. I’m actually learning to be careful not to take in too much..so that I’m not picking up too much and carrying it around with me…positive is terrific, negative..not so much. I’ll take a look at that research (I love reading research…perpetually curious here…)after my day of mirroring the kids’ expressions at school…. : ) …hopefully mostly positive! The part that really caught me up was “being PRESENT” with others when they are talking with you. The eyes is definitely an outward means of showing you are connecting. However, I know many professionals who can SEEM to look right into your eyes and have their minds far away. We must be present with our spirit in the presence of other people’s spirits! Kathy, well-said. I am not an active listener–and I’m a teacher. 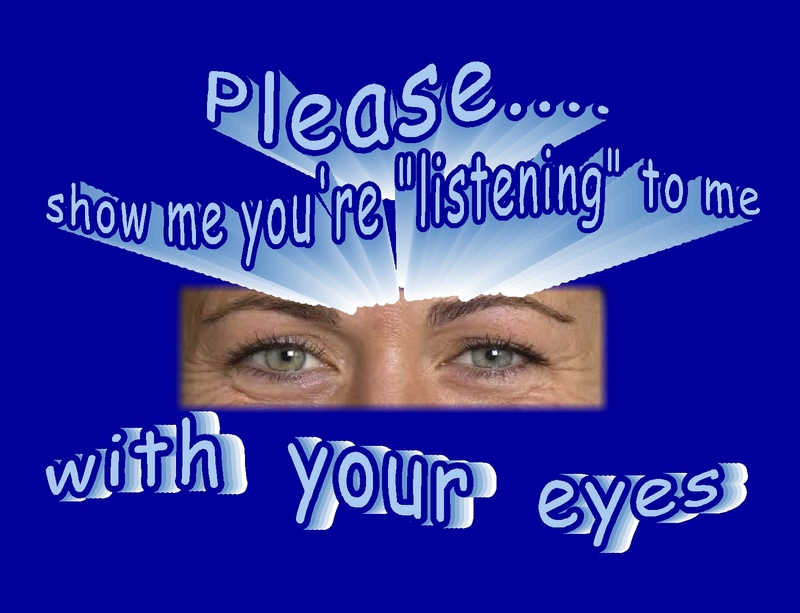 But since I teach second-language learners, I always tell them to listen with their eyes! Great post! 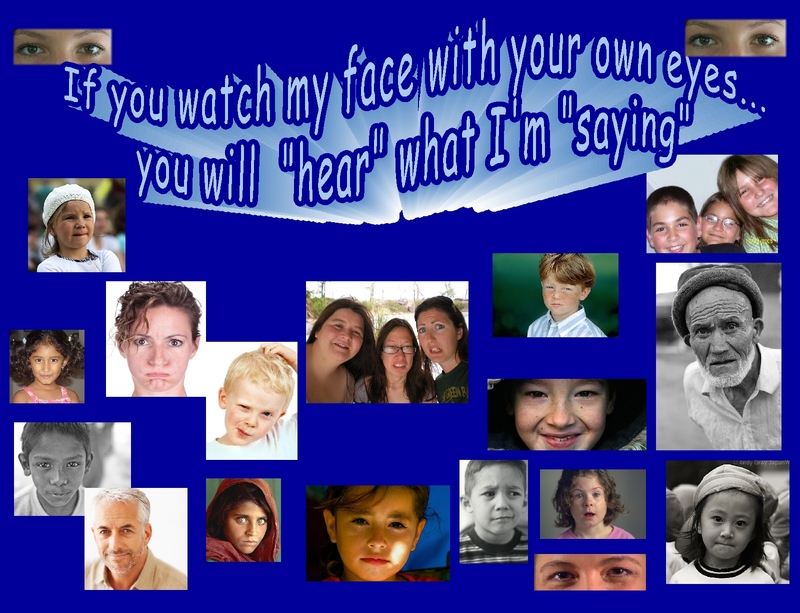 For many years, I taught children with hearing losses…they were amazing in their ability to send and receive communication with their eyes and facial expressions…I loved working with them…I learned so much from them, too. Some of the kids I teach now have attention challenges and are so busy and active that they miss so many social cues/information from other people’s eyes and faces…and often don’t realize what they might have done that bothered others. Kathy, So very well done. As I was reading your post, I was also aware of how important eyes are to those who have hearing challenges, so had to reply to your comment. Eyes and body language helps me to “hear” and sometimes the eyes and body language says much more than the words can convey. I have also noticed, we need to quiet the mind when listening because if we are busy having an internal chatter we are not present for the other. You know how it goes, while the other is talking perhaps too long, 😉 we may thinking, “I am hungry”, “hmmm… my house is going to look nice when,,,” and before we know, we didn’t listen to a word. Marie, thank you for your comments…the depth of your own experience since you’ve had the hearing loss adds such an important level of insight to the ideas…thank you. There is a wonderful book…Emotions Revealed…that is written by Paul Ekman..about learning to read facial expression and “micro” facial expressions…those fleeting, mini-expression that communicate so much…I’m sure that you’re already doing that. Thanks, Kathy will check out the link out of curiosity. And yes, I do know how to read faces and body language very well, even can “hear” accents without the sound of the voice (as when sitting a few feet away from commuters in a noisy NY train where it’s hard to hear the sound of the voice even for normal hearing folks) by the speaker’s movement of the lips when speaking a language I am familiar with . It’s an odd ability, but nature definitely compensates for the loss of a sense. Oh, the links were more for general interest…I almost put them into a separate comment box…. I think you probably already know all of that… And that’s amazing about you being able to hear accents by the movement of the speaker’s lips…I guess it makes sense, since individual/combination speech sounds require varied lip/mouth positions…that’s very interesting. Hi Kate…oh, you’re very welcome…I’ve learned a lot through the ideas from that workshop and then tailoring/adapting them to my home, family and friend life. I find different people have different comfort levels with amount of eye contact…sometimes sustained eye contact is difficult for people, in which case one can do a “come and go and back again” with the eyes. yes, listening to others with our EYES…how so many do not do that. I have a book by Kerrie and Chris Shoot: Love at last sight, and I believe it’s the book that challenges couples or what have you…to really look at the person when they are speaking and not to interrupt them and to really listen and say important words back – not just aha haa or what have you. I took a workshop last fall where we discussed and practiced same… eye contact! All the rushing around means we don’t even really look at people half the time. What a good workshop that must have been…and such an important reminder for them to offer…bringing one’s presence to others… and rushing around really does impact that. Ever try talking to a teenage son or daughter as they “listen” while text-messaging someone else? “LOOK AT ME” I have shouted on more than one occasion. Yes, the eyes have it. They’re the best tools we have at trying to comminicate and truly understand another person. Blogging is a pretty good tool, too. And teenagers….ah, yes…I think one of the points of them NOT looking IS deliberate… not wanting to make a connection…choosing autonomy and separations instead of being willing to connect…parenting teenagers was a whole other world…whew..survival skills…..
Reading this again after losing more hearing makes it even more meaningful to me. When I told my mate Phil yesterday that my ears start ringing when I try to hear him, he said “stop trying to hear, right now you can’t do that, just listen by looking at me and reading lips.” And I did that today, and we communicated without struggle or ringing of my ears. We were in each other’s presence. I felt at peace today, kind of a quiet surrender and humility at the power of the spirit moving through me. Thanks for leading me back here. Your writings serve. Marie, I’m so pleased that the words connect with you…you can see by the comments of others in this post how precious the eyes are in communication…both giving and receiving…And what a wonderful and helpful response Phil had…and that it led to communicating without struggle or ringing…wishing you a restful night’s sleep and a calm and peaceful day tomorrow… and I hope you wake up singing tomorrow morning, whether you can hear yourself of not, it will be lovely!